JNN 22 Sept 2014 Berlin : Thousands of Muslims across Germany have taken part in a protest against atrocities carried out by the ISIL Takfiri terrorists. 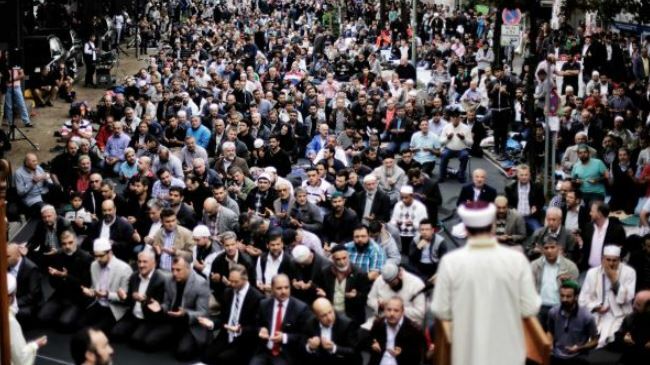 The Muslim community of Germany held a Friday Prayer ceremony in 2,000 mosques across the country in protest against the barbaric ideology of ISIL and its savage deeds. Organizers of the event, entitled the Day of Peace, said the protest was held to make it clear that the majority of Muslims in Germany and across the world are against the ISIL. Addressing the Muslim population in the capital, Berlin, the chairman of the Central Council of Muslims in Germany, Aiman Mazyek, said the ISIL members are “in truth terrorists and murderers” who are misusing the Islamic faith. “Islam is a peaceful religion,” Mazyek said, adding that the Muslim population all around the world should demonstrate a united front against ISIL. The event in Germany also involved nine other large demonstrations in cities across the country, including Stuttgart, Hanover, and Molln. The German government has estimated that at least 400 German citizens have gone to Iraq or Syria to operate alongside the ISIL. European states are concerned that those militants who return to their home countries would pose a security threat to Europe. Some observers, however, say the rise of the ISIL Takfiri threat can be directly attributed to the policies of Western countries in the Middle East. The ISIL have committed heinous crimes including mass execution of people and beheading of the captives in the areas they have seized. The terrorists have taken over large parts of Syria and Iraq. This entry was posted in Jafria and tagged Aiman Mazyek, Germany, muslim community, muslim population. Bookmark the permalink.